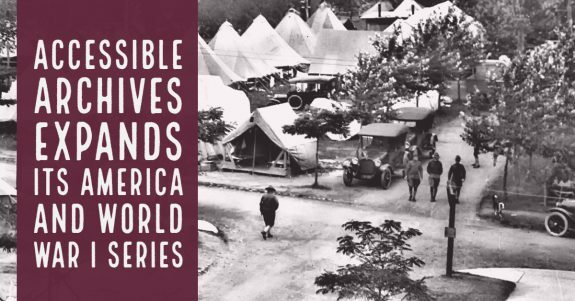 Malvern, PA (September 12, 2018) – Accessible Archives, Inc.®, a digital publisher of full-text primary source historical collections, announces additional titles to its World War I: American Military Camp Newspapers. American Military Camp Newspapers, Part II provides additional military camp newspapers – 12 new titles with 14,849 pages — that support those widely studied topics on America’s contribution to the War effort, the immediate postwar period in America, and the American Expeditionary Force’s “march to the Rhine” to take-up occupation duty. By browsing these scanned newspapers, users will complement their coursework in many areas including American history, social history, political science, military history, and more. This new collection from Accessible Archives provides an unparalleled research experience for students and faculty who would otherwise be unable to access these materials formerly held in microform. In addition, MARC records are now available. These Camp newspapers also include non-war related advertisements, poetry, short stories, memoirs, jokes, and cartoons. Photographs and sketches portrayed life in the various camps, on the home front, at the battlefront and in the occupied parts of Germany. Students, faculty and researchers in a broad range of disciplines will applaud the publishing of these additional camp newspapers. They are the voices that have demanded additional primary source content that can be used to fuel new and expanded research opportunities. This addition to the American Military Camp Newspapers collection continues to unlock the immediate past so that researchers can examine America and its people during a tumultuous era in our nation’s history, enabling a better understanding of our nation’s issues and concerns, both then and as they relate to current events. There is truly not one part of the nation that was not touched by World War I. American Military Camp Newspapers provides the potential to remind people of the war’s far-reaching significance and perhaps uncover new stories about the American soldier’s experience that we have not yet heard. Great News for Accessible Archives’ Subscribers – Your Subscription Now Includes This New Product! Contact us for more information and permanent access pricing! We have package pricing available! Accessible Archives utilizes a team of digital technology and conversion specialists to provide vast quantities of archived historical information previously available only in microform, hard copy or as images only. Databases containing diverse primary source materials – leading books, newspapers and periodicals – reflect broad views across 18th and 19th century America. Accessible Archives will continue to add titles covering important topics and time periods to assist scholars and students at all academic levels. Unlimited Priorities LLC utilizes its highly skilled group of professionals to provide a variety of support services to small and medium-sized companies in the information industry. The Archival Initiatives Division (AID) offers practical consultative services to libraries, historical societies and associations. AID provides advice and assistance in archival content selection, rights ownership, project management, workflow analysis, production, distribution of converted content and interaction with commercial entities. By coordinating a library’s project requirements with commercial firms’ interests, Unlimited Priorities creates an atmosphere of mutual cooperation while organizing a successful process at a reasonable cost.